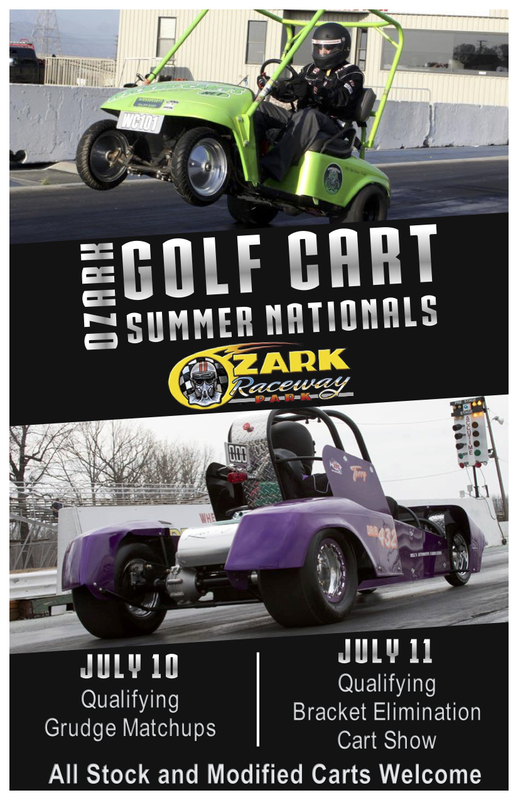 Ozark Golf Cart Summer Nationals!!! Ozark Raceway Park in Springfield, Mo. 1/8th mile golf cart drag racing and cart show and shine. Grudge races are encouraged on Friday night. Come and bring your buddies and see who has the fastest cart!!! This event will be held in conjunction with the IHRA Mickey Thompson Fly Your Flag Shootout. There will be many super fast Pro Mods, Drag radial cars etc.. from all over the country there racing that weekend including Scott Holdridge's "Black Ice" jet dragster. It will be a great weekend of racing! There is also lots to see and do around the Springfield/Branson, Mo area while you are there. Admission at the gate is $25 for cart and driver with an additional $10 to cover the cart show and race. We will split the cart field into 2 classes once qualifying is complete so the carts will be grouped as closely as we can according to the et and speed. Trophies and cash payout for both cart classes and trophy for the show and shine. Helmets are required for all cart drivers!! Camping is available at no extra cost but there are no hookups. It is not necessary to be there both days so if you can only make it for Saturday that is fine. I will be there on Friday morning and my race trailer will be the cart race headquarters. We will attempt to get a block of pit spaces so the cart folks can all be together so please let me know as soon as you can if you are coming so I can arrange that. Sorry that I'm not able to do a full blown rodeo style event. We will discuss the possibility of doing another show with more events with whoever attends this race. ORP is open to whatever we want to do I just need people to step up to help with the events. There is a large amount of space at ORP with a dirt pulling sled track on site and places to off road. Everyone is invited!!! Bring your carts from bone stock to wild!!! It's going to be a great weekend!! Let me know if you need any further information. We will see you there! That looks like a blast! I'd love to just be a spectator. If only it were closer. It's only half way across the country Mike!! How much is spectator admission? I believe it is $7.00 with kids under 12 free. We will have 3 other families from my area going. At least 5 carts coming from Indiana. Its gonna be a great time. That's awesome Troy!!! I'm looking so forward to it! !